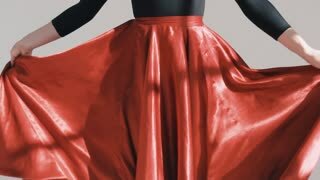 Search Results for "Dancing long red skirt"
Slowly shooting a girl's dance in a long red dress with a lush skirt. A dancer with a natural make-up, her hair loose makes twine in the air, gracefully raises her hands, sensually dances. Attractive female in long red skirt jumping and dancing outdoor in a park. She happy of enjoying time spending. Sunrise or sunset beautiful light. Super slow motion shot. Young woman in long red skirt jumping and dancing outdoor in a park. She happy of enjoying time spending. Sunrise or sunset beautiful light. Attractive man in velvet jacket and pretty woman in long skirt and red scarf are playfully dancing tango on concrete pathway in winter street, surrounded by cars passing by and trees without leaves. Woman posing in a fluttering red skirt. Red cloth fluttering. A slender young dancer swirls in a long skirt outside on a rice terrace in solitude. The train of the dress is developed by the wind, the girl enjoys freedom and loneliness, slow-motion shooting. MOSCOW, RUSSIA - DEC 22, 2012: Red skirt and legs of woman dancing in House Flamenco Flamenqueria. Opening of House of flamenco Flamenqueria took place in 2011. MOSCOW, RUSSIA - DEC 22, 2012: Red skirt and shoes of woman dancing in House Flamenco Flamenqueria. Opening of House of flamenco Flamenqueria took place in 2011. Girl playing in yard with rope 2. Slow motion. A close-up of a young girl walking along a rice field, waving her silk flowing skirt, the wind develops her hair, she focuses forward, walks away from the palm jungle, slow-motion shooting.